Stanford University researchers have developed a method to reapply natural enzymes adapted from bacteria to flip specific sequences of DNA back and forth, which can serve as the genetic equivalent of a binary digit. "Essentially, if the DNA section points in one direction, it's a zero. If it points the other way, it's a one," says Stanford graduate student Pakpoom Subsoontorn. "Programmable data storage within the DNA of living cells would seem an incredibly powerful tool for studying cancer, aging, organismal development, and even the natural environment," notes Stanford professor Drew Endy. The method also could form the basis of non-volatile memory. 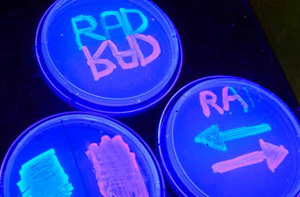 The researchers call their method a recombinase addressable data module, which they used to modify a specific section of DNA with microbes that determines how the organisms will fluoresce under ultraviolet light. The researchers had to control the precise dynamics of two opposing proteins. "Previous work had shown how to flip the genetic sequence--albeit irreversibly--in one direction through the expression of a single enzyme, but we needed to reliably flip the sequence back and forth, over and over, in order to create a fully reusable binary data register, so we needed something different," says Stanford's Jerome Bonnet.